Cutting out carbs, going on juice cleanses, and sipping on several cups of bone broth each day are just a few of the diets that have been popularized in recent years. Though it may be easy to dismiss the paleo diet as another one of the restrictive fads adopted by people simply hoping to trim their waistlines, many who commit to the paleo diet do so to benefit from a healthier lifestyle or as a way to handle food sensitivities caused by certain diseases. In Westport, Conn., the paleo diet helped one mother-daughter culinary team find relief from autoimmune disease symptoms – and create a safe haven for others dealing with dietary restrictions. That difficulty inspired the Hartogs to open a paleo café in June 2017, though it wasn’t their first foray into the culinary world. Both attended culinary school, and before opening NewBrook, collaborated on Cindy’s Sous Chefs, a cooking class and private event company. After their diagnoses, the mother-daughter duo – who have always shared a “passion for food and cooking” – decided to solve their lack of safe dining options by starting their own paleo café. At NewBrook, Danielle is the head chef and Cindy is the baker and dessert chef. All of the recipes at NewBrook are created by Danielle and do not include corn, gluten, milk, or soy; an emphasis is also placed on sourcing food that is humane, organic, and sustainable. Cindy finds operating the paleo café rewarding because of the support and gratitude she and her daughter receive from patrons with food intolerances and dietary restrictions. Before they opened NewBrook, there was some concern that a paleo café, which many would consider a niche business concept, wouldn’t succeed – but Cindy and Danielle soon discovered the demand for paleo cooking exists in Westport and beyond. 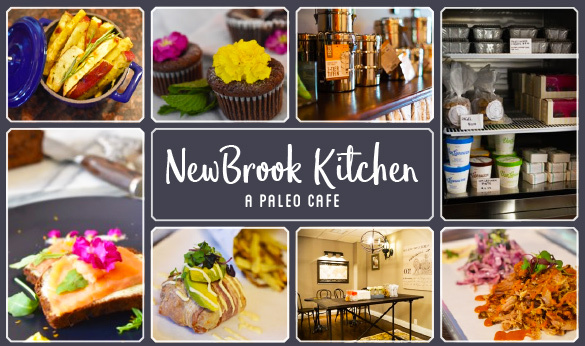 Because paleo cafés are still a relatively new concept and the paleo diet itself is often misunderstood, advertising NewBrook as a paleo establishment may potentially scare away diners who are unfamiliar with the diet. As Americans continue to seek out healthier food options, paleo cafés and other restaurants catering to more specialized diets offer unique dining opportunities.